I have absolutely love seeing all your versions with the same sketch! I can really see the cards morph as the different papers surface to the top on your desk! Congrats on such an accomplishment! 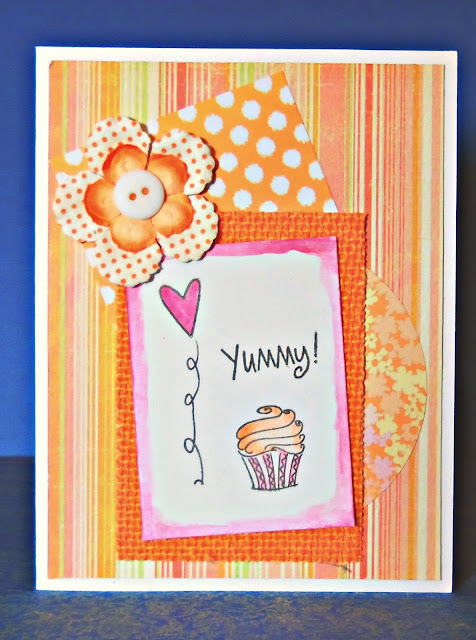 Love your pretty pink and orange combo for this pretty card to wrap up your fun Blog Blitz! My favorite part of your 11 posts has been to see all the variations on the sketch! This so reminds me of my brother's cats - he has to put his loo paper in the cupboard so that they don't do this! Lovely card - great combining of spots and stripes. I really think I should go back and have a look at some of your blog blitz posts when I get the chance. I really have only had a quick look at the cat pictures as they have come up on my reader as I have been unwell all week! that cat with toilet paper reminded me to other day when I found all my toilet papers in my cabinet in bathroom wall destroyed by my cat! my favorite parts where founding some new things about you . Love your sweet kitty photo! Sweet card too, love that adorable little cupcake. I think this card is lovely too, Janis. Its been fun. Glad I found time today to catch up! My favorite part of the blog blitz is seeing all these hilarious kitty photos! Where do you find them all? My favorite is the kitty with the yarn in his mouth! Oh yummy! This card reminds me of a creamsicle on a stick! Or maybe one of those orange flavored Hostess cupcakes that seem to appear only during the spring and summer months. (yes,I am a connoisseur of junk food). Either way, I love this lively orange confection and I thank you for inspiring us (and me in particular) with your eleven happy sketch cards this week. You almost made me a fan of sketches! As for my favorite part of the blog blitz, it was letting us share in the discovery of how many ways this sketch could be used...and how a card plan can often go astray as your paper scraps develop minds of their own. Still have to laugh that you failed to make even one masculine card in the bunch!! Thanks for a creative and entertaining blog blitz and celebration! Who says you can't put spots and stripes together. what do they know!!!!! Do we get to have the masculine card now though? Loved seeing all your creations. Best part for me is seeing how you have contrived to get even just a tinsy bit of pink creep in each time which just goes to show that your really a pink girl at hesrt just like me. Hugs Mrs A. Your last card is also super adorable. I really enjoyed how you showed how you can use your scraps to make wonderful cards. I also like the color combos you used. Lastly I like your cat cartoons. I have loved seeing the different color combinations. You have also inspired me to pull out some scraps and get my craft on! How fun! Love the watercoloring. Thanks for blitzing our sketch and playing along with our Inspirations challenge. All of your cards were so delightful. Another cute card. Thanks for sharing this great sketch. I plan on using it. I enjoyed seeing the mix of papers you used and it was to see how many were in my stash too. Such a lovely card Janis! I love the sweet image and gorgeous colors! Thank you also for joining my blog and posting about my 500th follower giveaway!!! I appreciate it! I am now also subscribed to your blog here! I hope you take advantage of our weekly Funday Friday challenges too! Have a great day!!! Oh I did laugh at the kitty photo today - perfect! my fave part was actually the questions--cool! LoVe your cute card. Thanks for sharing. I have had fun answering your questions and seeing your wonderful cards. It has also been fun seeing how that masculine card escaped your creative clutches too. lol. it's perfect...Thanks for joining a2z. What a fun and bright card, I love the cupcake! Thanks for joining us at a2z!!! Pretty card! I like the sunny colors you used! Thank you for entering our challenge at Country View Challenges!